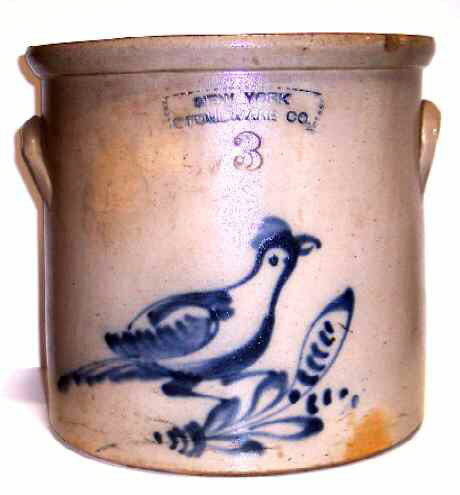 Presented here, a fine 3 Gallon Stoneware Crock with Cobalt Bird on a Branch Decoration. Marked New York Stoneware Co. (Troy, NY). Applied Ear Handles and Albany Slip Interior. The color is quite even with the exception of the area you see in the photo, but the digital camera makes it look much darker than it is in person. Overall condition is very fine with the only apology being a small flake on the rim on the upper right which can be seen in the picture.